Eugene Twist is a singer/songwriter/musician from Glasgow. On this his debut album, he not only wrote the songs, but sings them as well as playing guitar, drums and various other instruments. It's not totally a one-man show though - he does have a group of musicians playing other instruments - bass, keyboards, violin, clarinet, saxophone, cello and extra guitars. The music is a kind of easy-going relaxed pop music, which is really pleasant and enjoyable to listen to. 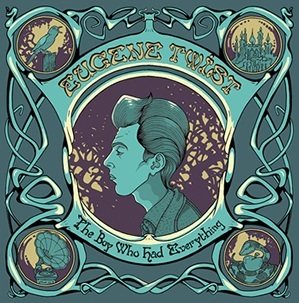 Whereas many singer/songwriter/musicians seem to go for more of a busking style with the sound really being dominated by a guitar and the vocals, Eugene Twist has produced an album with a richer more varied sound - having those extra musicians involved has really paid dividends. The album opens with "If there's love where I'm going", which has a nice moderately fast paced saxophone introduction setting the tone nicely. The song maintains the brisk pace, with acoustic guitar to accompany the vocals and the sax kicking back in between verses. "It's down to you" has a more laid back pace and is a more stripped-down song. It works really well too. Gauguin is a really good song and is probably my favourite on the album. It's hard to define why exactly that it - it just works for me. This is a very impressive debut album. It's got plenty of variety, the songs are well written and the range of instruments used gives the songs a much fuller, more interesting sound.